This mod adds a lot of decorative blocks, which are obliged to diversify your buildings. Using them you will have new styles in the construction of structures, as well as new opportunities for the reconstruction of old ones. 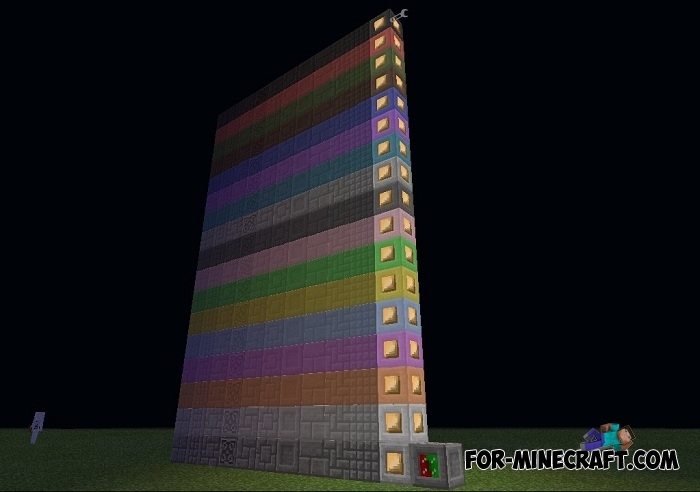 The Decoration Blocks mod contains 11 variations of stone blocks, the lamp is one of them and an additional 16 colors for each variation (like wool). If you need more colors then activate the mechanism that allows you to paint these blocks. In aggregate, there are 188 blocks that can be perfectly used in the construction of anything. How to install the Decoration Blocks mod? 1. For work you need to download and install Inner Core, you will find it here - IC for MCPE. 2. After installing Inner Core, move the DecorationBlocks folder from the archive to: games/com.mojang/mods after deleting the previous version.